.Battle of Köse Dağ (1243) - The Seljuk Turks who had fought for so long against the European Crusaders, as well as the Arab Muslims, were not ultimately defeated by either one of them. It was the ever-expanding mighty Mongol Empire from the East that finally took them down (though not permanently, as we shall see). The Mongols reached the eastern border of the Seljuk Empire in 1242. 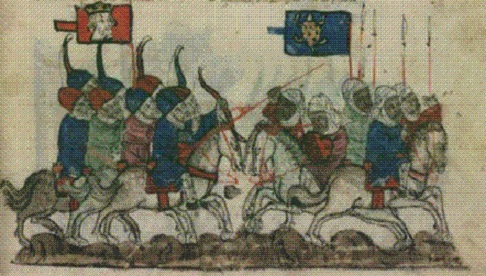 Sultan Kaykhusraw II mobilized an army to try and halt the Mongol advance. They met at Köse Dağ in northeast Anatolia on June 26, 1243. Although the size of the armies is not definitively known, it's generally accepted that the Turks had the larger army. The commander of the Mongol army was Baiju, and when told by scouts that his force was outnumbered, he dismissed it declaring that the victory would be that much more impressive. Kaykhusraw II ignored the advice of his generals to let the Mongol army come to him. Instead he attacked. The Mongols feigned retreat, then turned suddenly and attacked the Turks. The Turkish army panicked and quickly folded. The front lines were cut down, and the rear troops deserted the battlefield. Kaykhusraw II survived and was allowed to live. He became a vassal of the Mongol Empire. However, 17 years later, the Mamluk Turks rose up and defeated the Mongol army at the Battle of Ain Jalut in 1260. Although not marked on this chart, Ain Jalut was a significant conflict in history in that it represented the first time that the Mongol Empire contracted as a result of warfare.